Comforting, filling, and healthy vegan mac n’ cheese, featuring cashews, miso, nutritional yeast, and coconut oil. While pasta is cooking, wash the chard or kale stalks while separating the leaves from the stems. Discard the stems. Towel-dry the swiss chard or kale leaves, rip up into bite-sized shreds, and place into a bowl. Drizzle olive oil on the swiss chard or kale and massage oil into each individual shred. Put to the side. Combine cashews, nutritional yeast, miso paste, coconut oil, teff flour, onion, lemon or lime juice, water, and sea salt in a blender. Blend on highest setting until smooth. Transfer into a sauce pan, and heat over low, stirring continually. When the sauce starts to become thick or the desired consistency, combine it with the pasta. 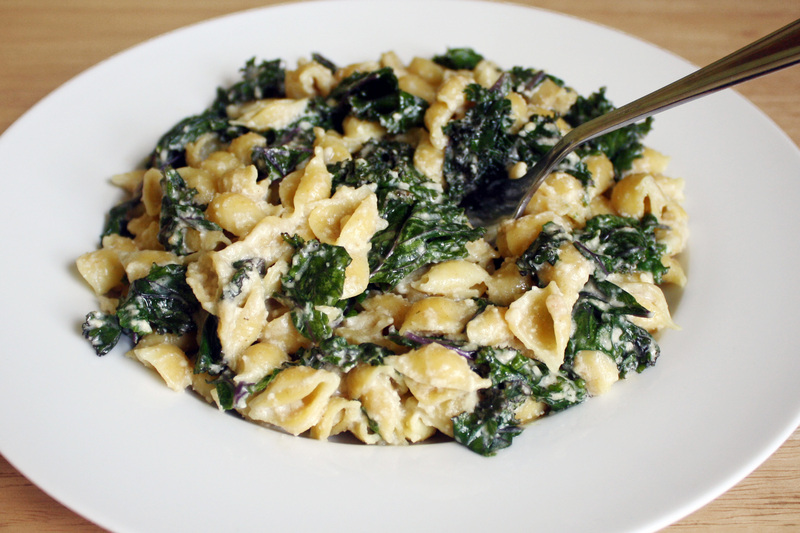 Toss until the chard or kale, pasta, and sauce are thoroughly interspersed. You are now done. Enjoy!